For those of you that have been around for a while, I am again attempting to lose weight. But the exciting news is that I'm not using Weight Watchers or trying C25K again. We all know that I have been there and done that. Quite a few times. This time I needed something different. What? You never heard of it? I'm not really too surprised. I had only heard of it a few times prior to this past weekend. We were out and about doing non-kid-friendly activities like eating at fancy restaurants and going to the symphony since it could be our last kid-free weekend. Because did I mention we are licensed?!?!? Anywho back to this diet thing, over dinner at that fancy restaurant I was talking with a wonderful family friend who mentioned Ideal Protein. She had great success with the plan in the past and was thinking about going back on it to lose those pesky last 10 pounds. I love hearing success stories from skinny people because that is proof in itself that it works! She explained how the program is setup and it all seemed to make logical sense. High protein. Lots of veggies. Very very low carbs. No sugar. The part I really like is that you eat 3 of their foods a day, leaving you only to cook dinner. Besides the convenience, I like that the hubby and I can eat the same food for dinner. And he liked that steak is still on the menu! The saddest part is that alcohol is not allowed. This means I had to send this. Note to self: Next time you decide to get all healthy, don't do it the day before girls' night. 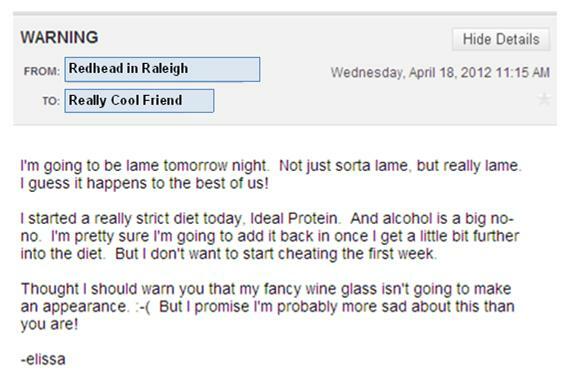 Disclaimer: Alcohol is a big no-no on this plan. But I am not planning on cheating without consent. 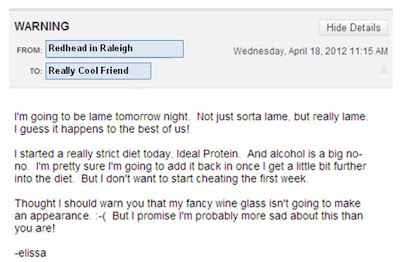 My coach bribed me with a few drinks per week in the future if I follow the plan exactly in the beginning. That's a carrot I'm willing to work for!